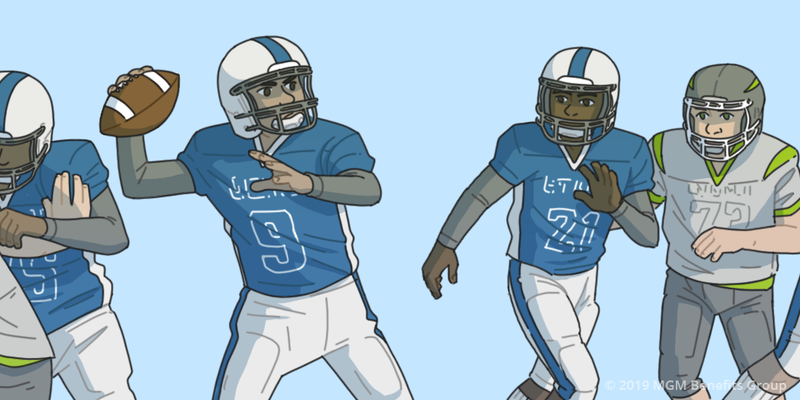 The big game is around the corner and children around the country are trying to emulate their favorite football players. Whether they’re in the backyard playing a pickup game or under the bright lights of their school’s football field, chances are they’re picturing themselves playing inside Mercedes-Benz Stadium. For as fun as the game is, there are risks to letting your kid play. A recent study revealed that high school athletes account for nearly 2,000,000 injuries, 500,000 doctor visits, and 30,000 hospitalizations every year1. Accident insurance provides a cash-benefit when you suffer an injury from a covered accident. You can use this money to help minimize medical expenses or pay toward other out of pocket costs. The coverage can extend to your spouse and children as well. That means no matter what lifestyle your little athlete leads, you can have peace of mind knowing they’ll be covered with your policy if the worst were to happen. Until then… game on! Who do you think will walk away with the trophy after Sunday’s game? Accurately predict the answer in the comment section below and we’ll give you a shout on social media next week! If you want to learn more about the benefits mentioned above, get in touch with us by clicking HERE!